As anyone who knows us will know Chloe my eldest daughter loves art's and crafts and is forever making things and drawing. So when Galt toy's recently offered her the chance to create her own 'mini-masterpiece' she was over the moon and couldn't wait to get started. 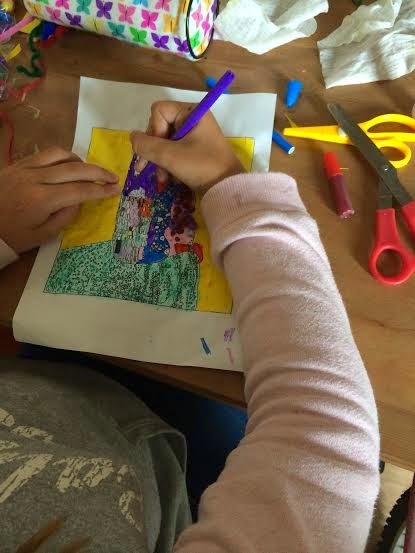 Galt recently launched a 'mini-masterpiece' series which is six famous work's of art that they have templates of on there website that you can print off and get your children to colour in and decorate themselves to recreate there own 'mini-masterpiece'. 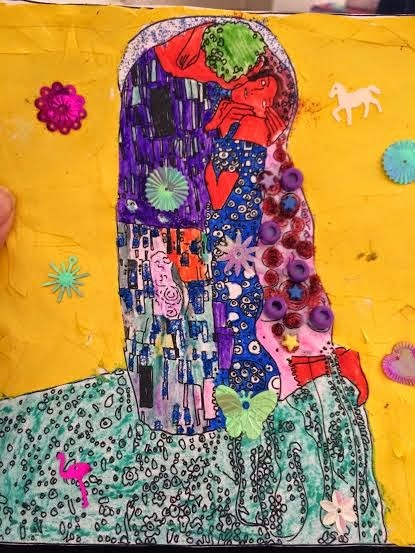 Chloe was kindly sent a art jar from Galt to help her create her own 'mini-masterpiece ' which was The Kiss by Gustav Klimt. Firstly we printed off a template of The kiss from the Galt website and then Chloe got to work on decorating it with the contents of her art jar. Firstly she cut out and glued some yellow paper that was in her art jar and stuck this on to her template as the background for her picture. 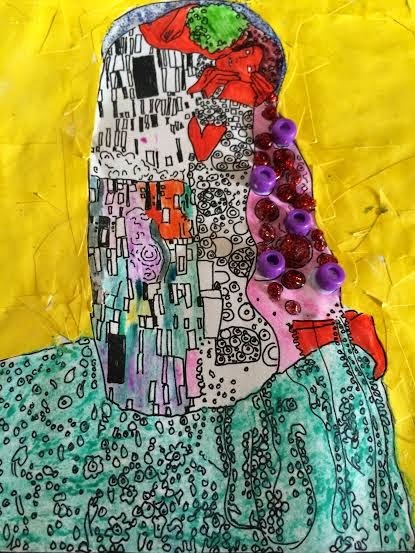 She then coloured in parts of the picture with some of her pens and then she decorated with glitter, sparkly shapes and beads that were in her jar. Chloe had a lot of fun creating her own 'mini-masterpiece' and she sat at the table for a couple of hours happily decorating it. She was happy with her finished result. This series is a great idea for children as it introduces them to famous artwork and it also lets them be creative when creating their own works of art. The art jar that we got is full of lots of material such as paper, glue, glitter, beads and pom poms to name just a few of the contents which are ideal to create lots of lovely works of art with. With the summer holiday's fast approaching I highly recommend that parents have a look at the Galt website and print of some templates so that their children can create there own 'mini masterpieces'. We plan on printing some more off for Chloe to decorate. 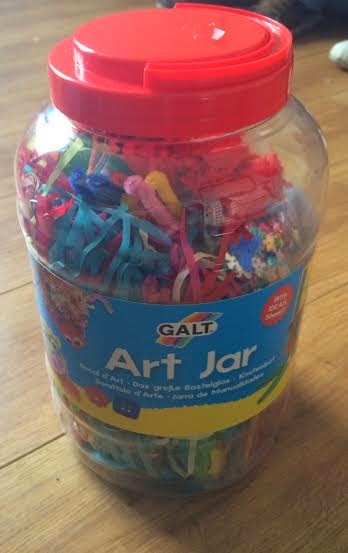 *Disclosure: I was kindly sent the art jar by Galt to help my daughter create her own mini masterpiece. However all words and opinions in this post are my own honest view and I was not paid for this post . Good activity for children :- Arts and Crafts. Seems nice introduction for them to masterpieces and artists etc. Well Done Galt.